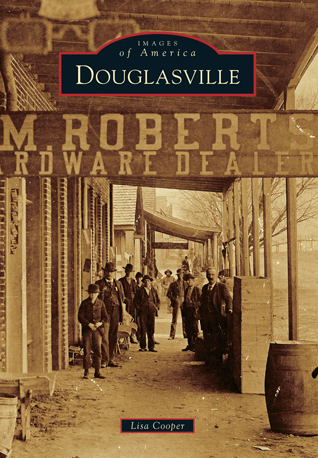 The formation of Douglasville coincided when New South ideals were reshaping villages into railroad towns across the South during Reconstruction. In 1875, business and political leaders worked from the ground up to provide Douglasville with each component of a New South town, including a railroad, cotton mill, hotel, bank, and a commercial district. Today, the central business district is listed in the National Register of Historic Places and presents a snapshot regarding how the town fathers actualized their vision of industry and enterprise. Douglasville's founders would be pleased if they visited the town they created 138 years ago. It has entered the 21st century as a vibrant city with a thriving historic district, as well as a destination for businesses ranging from Google to the American Red Cross. Lisa Cooper, a former classroom teacher turned curriculum designer, writes a weekly column published in the Douglas County Sentinel, where she shares the amazing history of Douglasville with her readers. This book was made possible through the contributions of private collectors, the City of Douglasville, and Douglas County government. Other photographs were provided by the Douglas County Public Library and the Douglas County Museum of History and Art.